Have you ever walked down the grocery aisle and were overwhelmed by the number of hot sauce brands yet underwhelmed by the options? Lucky for you, Extra Crispy outlined all of the best (and the worst) hot sauces found on our favorite grocery aisle. And guess what, Melinda’s Original Habanero Sauce was featured as one of the best! In my notes for Melinda’s hot sauce, I wrote, somewhat shocked, “actually tastes like peppers!” And it does! With an underlying earthy sweetness and a really bright, citric buzz, this was probably the most surprising of all the hot sauces I tried, and I loved it. The secret ingredient, it turns out, are carrots blended into the sauce. Carrots! I can’t wait to put this on roasted veggies and tacos, and integrate this into marinades. Thank you MyRecipes.com & Extra Crispy for the feature! Use coupon code EXTRACRISPY for 20% off your order. To view the full article, please click here, or see below. They say variety is the spice of life, and nowhere is that more true than in the hot sauce aisle of the grocery store. Multi-colored bottles of every shape and size hold a dazzling number of orange- and red-hued liquids, just waiting to be dotted on, well, literally any and every food. With so many options, what’s a spice-lover to do? Who’s hot and who’s not in the mass-market hot sauce game? 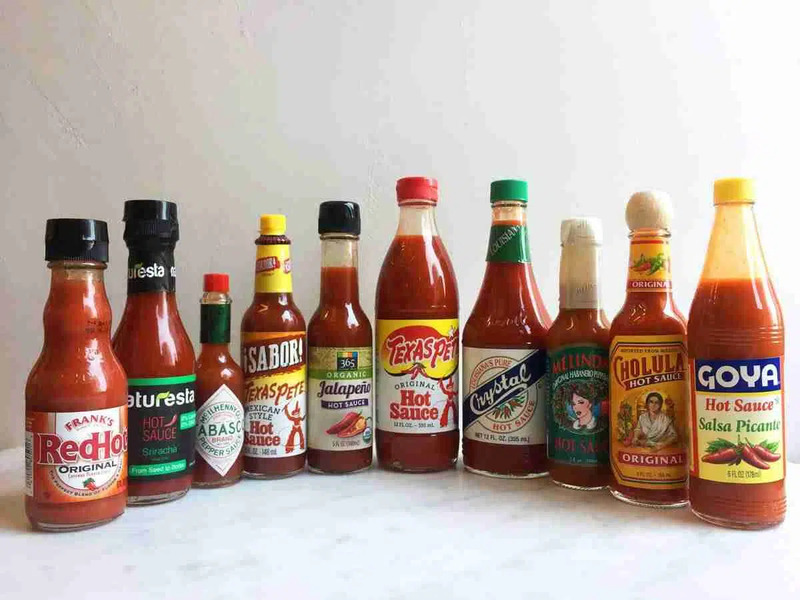 I sampled ten hot sauces on olive-oil-fried eggs—a classic in my breakfast routine—to figured out what’s good, what’s bad, and what should always, without fail be in your fridge. Texas Pete’s Sabor! brand is influenced by Mexican flavors, and that certainly comes across in this chipotle-like sauce. Packed with cumin and lots of garlic, this pick is delicious, but only for particular tastes. If you want to add a splash of this to scrambled egg tacos or huevos rancheros, I think you’d be very pleased. Crystal is one of the more vinegar-heavy hot sauce options, which makes it perfect for pairing with starchy breakfasts, like diner potatoes. The vinegary acid brightens up any food vehicles that can be a bit one-note. It has a good amount of heat, and it lingers. This is the hot sauce to jazz up so-so food that really needs it. Tabasco is not one of my go-tos. It’s a classic, but from my point of view, the texture is too watery and the taste is too barbed—the spice is zingy instead of smoldering. But there is a place for it: Take advantage of the bottle’s diminutive size and slip it in your bag or your pocket for on-the-go needs. It’s certainly way better than nothing when it comes to zhuzhing up your lunch. Frank’s is a solid choice, with a nice balance of salt, sweetness, and a little smoke. If you want a hot sauce that does a lot, this is a good option. It just won’t blow you away. Goya’s contribution to the hot sauce genre is unfortunate. If you like sprinkling red-hued water on your food, this is the one for you. Woo-ee. If you’re a spice-seeker, Texas Pete’s option will do right by you. The heat hits your tongue hard and—unlike many sauces—it hits you right away. The spice mingles with a hearty helping of white vinegar, which means your tongue tingles and burns at the same time. This is one for the extremists. 365 products are always a solid choice. This hot sauce is no different. It offers a pleasant balance of spice and vinegar, and would play well with just about anything on your breakfast table. If you need to stock up while you’re at Whole Foods, you will not be disappointed. Naturesta hot sauce is techincally sriracha-flavored, which I’m not sure I would have picked up on if I hadn’t looked at the label. That said, there was a nice sweet element here, but it doesn’t hit the other notes—acidic, spicy, salty—in a way that I’d hope. It was, however, undeniably the reddest option, so if you’re a visual person, have at it, I guess. Without a doubt, Cholula is the ultimate workhorse hot sauce. It’s well balanced, with acid, heat, salt, and a touch of vinegar shining through. It goes just as well on tacos as it does on fried potatoes, and I love it on eggs as much as red beans and rice. If you can only have one hot sauce in your kitchen, Cholula would be my choice. Use couponcode EXTRACRISPY for 20% off your order.